An empanada eatery with a similar look and menu to a popular neighborhood restaurant will soon be opening on the corner of Roosevelt Ave and 82nd Street. Mama Empanada, not to be confused with Mama’s Empanadas, will be selling more than 50 varieties of empanadas and will be located at 82-02 Roosevelt Ave. The venue will sell empanadas as well as rotisserie chicken and daily lunch specials, the owner Juan Ospina told the 82nd Street Partnership. 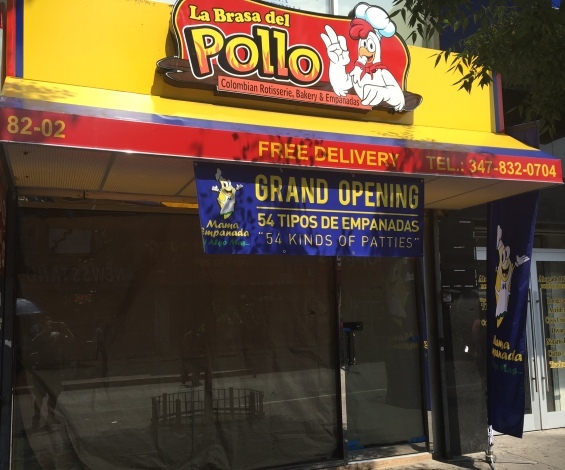 The restaurant is not a franchise or in any way connected to the popular Original Mama’s Empanadas, which has locations on Roosevelt Ave and Northern Blvd, Ospina told the 82nd Street Partnership. He said the name is ‘Mama’ not ‘Mama’s’. The restaurant also differs because it will offer more than just empanadas, he told the Partnership. Employees at the two Original Mama’s Empanadas confirmed that the 82nd street eatery is not connected any way. Ospina chose decided to open his store on 82nd Street due to the exposure and foot-traffic it provides. The establishment will seat 18 people. The restaurant, however, will focus on pickup and delivery. It will also offer catering. Leslie Ramos, Executive Director of the 82nd Street Partnership, is looking forward to the restaurant joining the neighborhood. The location was previously La Brasa del Pollo. these people couldn’t come up with their own name? stealing a name to try to trick customers? So its a bootleg Mama’s Empanadas. No thanks. Super, good luck to the owners!